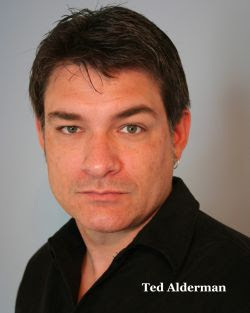 Ted Alderman is not only a producer, director, actor and martial artist, but also the founder of Wicked Dreams Entertainment (Scream Farm, The Deepening, Vampyre Tales. Ted was kind enough to give us an interview, tell us about his influences, and the steps he's taken to amass such an impressive amount of work in both the indie. and Hollywood film bizz. Thank's for the interview, Ted! Keep up the great work! DH: You've worked as producer, director and actor. Tell us which you prefer the most and why? TA: I really prefer working as an actor. I enjoy being able to work in different roles and it challenges me more to bring out what different directors want. TA: I personally didn't take film school, but I do agree that it's a great choice due to getting the full aspect of different jobs that go on during a shoot. That way you're already familiar with that type of atmosphere. DH: What films and/or artists have inspired you the most? TA: Chuck Norris has most inspired me to get into both martial arts and films. Next is Patrick Swayze for the guts to challenge himself to perform so many different type of roles in his career. As far as films, I would say in the action genre would be "Revenge of the Ninja" and "Moulin Rouge" in the drama genre. DH: Talk about how your skills in martial arts, stunt work, etc., have added to and incorporated themselves into you career. TA: When I first wanted to get into films I wanted to be a fight choreographer. Every film I watched I would study each and every move and pick what I wanted to use. 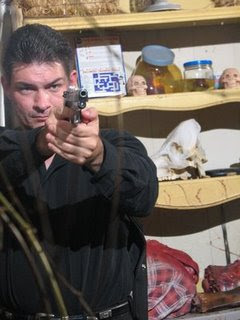 Then I started acting in Indie films and was given the chance to work the martial arts and stunt work with my acting since most Indie films don't have the budget to hire stunt/fight doubles. DH: What are the right and wrong steps people take when they first get involved in the business? TA: The first steps would be is keep promoting yourself. Never think that your name will get out there on it's own. Keep trying to get parts even if you get turned down. You have to keep going. Too many quit early cause they don't get roles they audition for. You may have to go to 100 auditions before you get one job. Also some people have quit due to thinking that they should make it in the biz fast and easy or they think they're going to make a ton of money right off the bat. In the Indie biz you're just not. In fact a lot of your early roles won't even be paid or you have to pay your own travel. Some people just aren't willing to sacrifice that and quit too early. You have to have persistence and just never give up no matter how long it may take to reach your dreams. DH: As a producer, what elements combine to draw you into a project? TA: Well I mainly only produce projects that my company 'Wicked Dreams Entertainment' is involved with making. But the elements would include a good story, decent actors and a great film crew. DH: What your personal favorite project to date? TA: Not to be biased but I would say "The Deepening". The second film that myself and my business partner/friend, Jim O'Rear made a couple years ago. It's my favorite mainly because I had come up with the original idea for the film. I'm a professional fire fighter so I called up Jim and asked him if he had ever heard of a fireman slasher flick and neither of us had. So I told him that's the next project I wanted to make. I gave him a couple ideas and he had wrote the entire screen play for it himself. Also its the first project I was able to use my martial arts background in a classic bar fight scene like Chuck Norris had done when I was a kid. DH: What's the best and worst thing about the indie. film business? TA: The best thing is having the chance to do projects you normally wouldn't have a chance if working in major 'Hollywood' pictures. Being able to do a wide range of different roles to build your resume before trying to move into the 'Hollywood' films. The worst thing is the money. Indie films don't have the budget like major films and you don't make, if any, a lot of money. As stated before, you just have to be willing to work for no or very little pay. DH: If you had to start over again, would you have done anything differently and why? TA: Well since I kind of 'fell' into it, I wouldn't of did anything different except that I would of started earlier then I did. But things happen for a reason. When I first met Jim, he really liked my acting ability and cast me in my first feature film "Wolfsbayne" now title "Aconite", we had similar thoughts about things and we just clicked like brothers. DH: What do you have in store for your fans in the future? TA: They will have to just wait.... No I'm kidding. I have in store much bigger and better projects coming up for them in the future. I have some things lined up and will keep people up to date on my sites. you and, better yet, order your films? DH: If you had an unlimited budget, what would your dream movie be and why? TA: Something with a Renaissance theme to it cause i just love that time era in history. It's the era when men still had honor and chivalry. Something that lacks in today's time. Also Patrick Swayze would have to play my dad and Chuck Norris as my teacher/mentor in it.